“Enlight’ning,” an art and literary magazine published each spring at the middle school, is in the running for the much-lauded Gold Crown Award, given by the Columbia Scholastic Press Association (CSPA). The publication, which showcases artwork, poetry and prose created entirely by middle school students, is one of only three such magazines nationwide to be short-listed for the award. 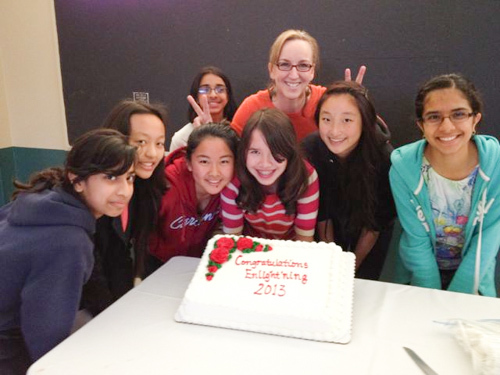 “While Enlight’ning has won several gold and silver medals from CSPA during its 12 years of publication, we have only won the Gold Crown Award once, in 2008,” reported Sabina Grogan, middle school expository writing instructor. “I’m truly so honored and humbled to have been a part of this talented team to create such an amazing magazine,” said Carissa Chen, who was the lead editor of the magazine, which was published in spring 2013 and which she worked on last year as an eighth grader. In addition to The Harker School, the two other middle school magazine Gold Crown Award finalists are the Kealing Middle School in Texas and Pierce Middle School in Michigan. Finalists will be presented with either a Gold or Silver Crown Award during the 90th annual convention held in March at Columbia University in New York City. Remaining awards will be mailed out at the beginning of April. The CSPA is an international student press association uniting student journalists and faculty advisors at schools and colleges through educational conferences, idea exchanges and award programs. The organization has been owned and operated by Columbia University since 1925.